I am not a big cheesecake fan, but my dad is! 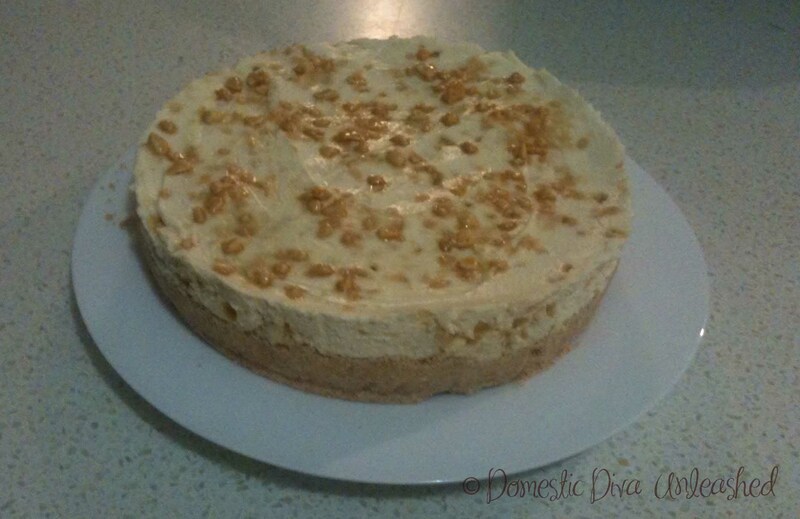 So since they were coming over for dinner, I thought I would have a go at making my first cheesecake, especially when I had a bag of failsafe honeycomb that I thought would be lovely crushed through it, and it was! Lightly grease and line a 24cm spring-form cake tin. Crush biscuits in Thermomix for 7 sec on speed 7. Set aside. Melt butter on 60 deg speed 3 for 2 mins. Add the crushed biscuits and combine together on speed 3 for 10 seconds. Spread mixture into the base of the tin and press down. Place honeycomb into thermomix bowl. Chop for 4 sec on speed 5 or until crushed into little pieces. Set aside. Place philly cheese, cream, sugar and vanilla into bowl. Mix on speed 5 for 15 sec to combine. Add honeycomb (leave a small amount to garnish the top of the cheese cake) and mix together on speed 4 for 2 sec. Pour mixture on top of biscuit base and smooth over the top. Sprinkle the remaining honeycomb over the top. Place into the fridge to set for a few hours before serving. 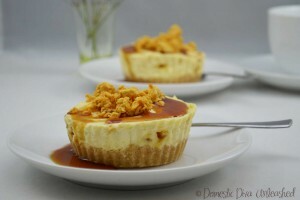 Another way to serve the cheesecakes is to make little individual ones in silicon cup cake moulds. I drizzled a generous amount of Honeycomb syrup all over it and sprinkled with extra honeycomb. Divine! Thank-you – I will order some… making it seems a bit too adventurous for me! Omg!!! This is amazing. Made it and honeycomb from scratch. Best. Dessert. Ever!